Experts say toxins in sediments could be tossed up by storms and threaten water for years. DURANGO, Colorado — The toxic waste gushing from a Colorado mine and threatening downstream water supplies in at least three states will continue to be dangerous whenever contaminated sediments get stirred up from the river bottom, authorities said Wednesday, suggesting that there’s no easy fix to what could be a long-term calamity. The immediate impact of the 3 million gallon spill was easing as the orange-tinted contamination plume becomes more diluted on its way into Lake Powell along the Utah-Arizona border. But the strong dose of arsenic, cadmium, lead and other heavy metals is settling out as the wastewater travels downstream, layering river bottoms with contaminants sure to pose risks in the future. 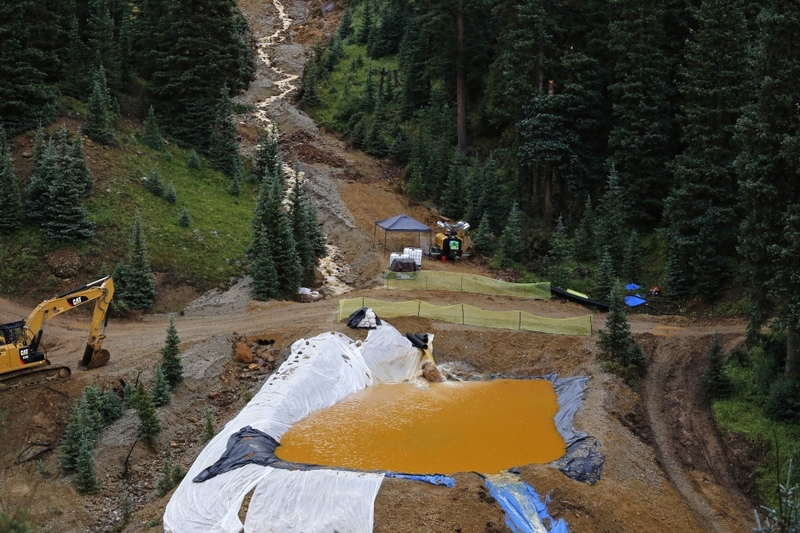 The Environmental Protection Agency had pushed for 25 years to grant Superfund status to the partly collapsed Gold King mine and other idled mine sites leaking heavy metals above Silverton, Colorado. That would have brought in major funds for a comprehensive cleanup. But local authorities spurned federal intervention, leaving a smaller EPA-led team to investigate the steady stream of pollution. That team accidentally breached a debris wall on Aug. 5, unleashing a huge pool of contaminated water. 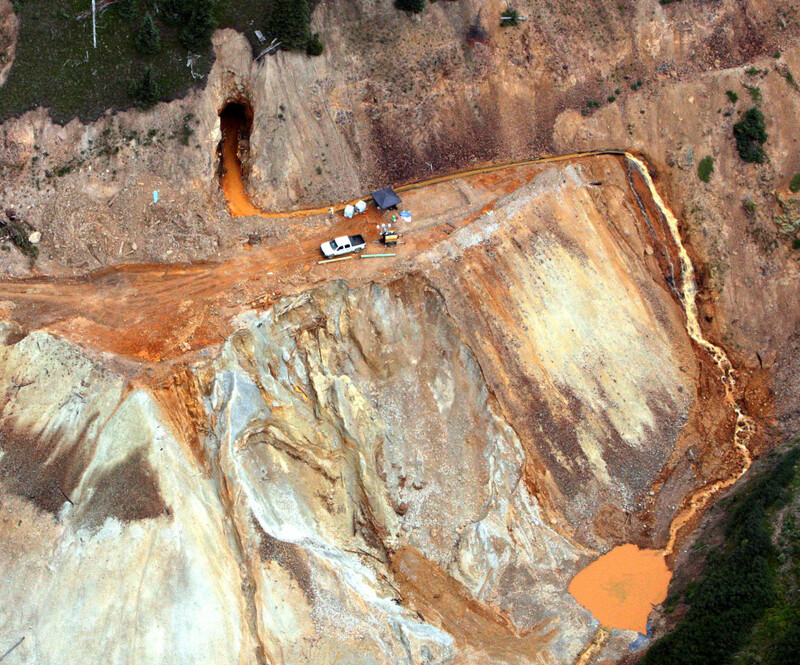 Yellow sludge still poured from the mine a week later, rushing downhill from a spot 11,300 feet high in the Rockies. An EPA cleanup crew hastily built a series of four sedimentation ponds, bulldozing mounds of earth and covering pits in plastic. The agency announced Wednesday that the ponds were effectively reducing acidity and dissolved metals, so while the runoff has returned to the pre-spill volume of about 213 gallons per minute, it is now cleaner than it was before the spill. Long before the accident, mines in the Silverton area that were first developed in the late 1800s had been releasing a steady stream of contaminated wastewater into streams and river, leaving some of them virtually lifeless. No fish swim where the Gold King runoff flows into Cement Creek and the upper reaches of the Animas River, which in turn feeds the San Juan. EPA tests on the sickly orange-yellow plume showed a spike in heavy metal levels that decreased as the pollution moved downstream. The tests won’t be considered final until they have been validated, which usually takes seven to 10 days. Environmental regulators in downstream New Mexico warned that sediments get kicked up by storms and high water, so it’s crucial to determine where contamination settles. Past mine waste accidents in the Rocky Mountains have shown that the impact can linger for decades, said John Stednick, a watershed scientist at Colorado State University. He cited efforts to clean up Colorado’s stretch of the Arkansas River that began with a 1982 spill, and the decades of fish kills after the Summitville Mine dumped wastewater into Wrightman Fork, near Del Norte, Colorado. “It takes years for sediments to clean once acid mine drainage has been removed,” Stednick said. The Gold King plume is already devastating to the Navajo Nation, which recently negotiated permission to pull San Juan River water through a $20 million treatment plant it’s building to serve 16,000 reservation families who still have to haul water to their homes. Heavy metals are already present in the tribe’s groundwater, and “now those same things are dumped in the river,” complained Rex Kontz, deputy general manager for the Navajo Tribal Utility Authority. He estimated Wednesday that meeting EPA standards for clean drinking water could double the plant’s construction costs and require them to spend millions more in operating costs each year. The EPA said it will be Monday at least, but perhaps take weeks more, before test results can help show what hazardous material is in the water. The higher the concentrations, the higher the cost of removing heavy metals. And unlike some other Native American tribes, the Navajo are not swimming in casino cash. Navajo farmers are nervously waiting for someone to announce that it’s OK to irrigate their crops again. Just two weeks without water could wipe out their corn and alfalfa just before harvest, which represents an entire year’s salary for some farming families. Long-term, they also worry that they’ll lose the ability to market their meat and produce as free-range and organic.